"Loyalty, Love, Friendship" is not only the meaning of the word "Claddagh" but the motto and spirit of CLADDAGH INN. Augie & Gerri Emanuele, the friendly and attentive innkeepers/proprietors, are responsible for the warm, welcoming atmosphere at the Inn. This renovated and meticulous clean Victorian Inn has been welcoming visitors to Hendersonville for ninety years and is on the National Registry of Historical Places. 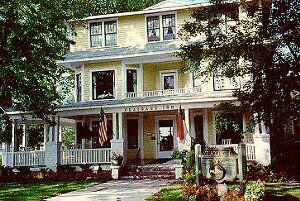 The bed and breakfast's architecture is Classical Revival, with a cheery yellow and green exterior, and a large wrap-around veranda with rocking chairs - a natural place to gather and visit with the innkeepers and the other guests. Inside, the cozy library has a wide variety of books to choose from, plus a piano awaiting that special person who loves to entertain or conduct one of the lnn's famous sing-along's. The library's Oriental rug and wood paneling also provide a comfortable setting for a warming glass of sherry in the evening. The lnn's dining room is delightfully decorated in cream and rose with beautiful lace curtains on all the windows, while the rest of the house sports a wide variety of antiques complementing the decorations in each individual room. All 14 guest rooms have private bathrooms, telephones, televisions, and air conditioning (in season). A new third floor 2 bedroom suite, 2 private baths and a private sitting room has been added. In the morning guests awaken to a full home-cooked country breakfast featuring juice, coffee or tea, with cereals, bacon, ham or sausage, creamy grits or toast, and eggs any style. Alternating extras always include home baked coffee cakes or fresh muffins, all prepared by Gerri. The CLADDAGH INN is an excellent pivot point for short drives to witness the breathtaking beauty of Western North Carolina's "Land of the Sky," the Great Smoky Mountains, Pisgah National Forest, or the Blue Ridge Parkway. Hendersonville provides some of the finest craft and antique shops in North Carolina, exceptional dining, and excellent cultural events, such as the Flat Rock Playhouse productions, performances at the Brevard Music Center or with the Hendersonville Symphony Orchestra. This and other Henderson Bed and Breakfast Inns can be found here in The Register.